Everytime we go for Caribbean foods in town, I always ask for a bottle of sorrel drink. I just love the flavour and colour; a rich natural maroon colour with a hint of spices. I have been planning to make this drink one day once I can get either fresh or dried sorrel. Luckily, the Caribbean/Indian store that I usually go for spices grocery was brought fresh sorrel for Christmas season. However, I forgot to buy it, then I decided to come back the next week and the fresh ones have been disappeared. Well, I still found the dried one which was only $2.99 per package (125 g). Sorrel drink is a Caribbean favourite during the Christmas season. When you visit a Caribbean family or friend’s house at that time, you will get to taste this sorrel drink. The beverage has acidic taste with sweet and spice added. Special for this holiday edition, I want to share an easy Sorrel Drink recipe with an Indonesian twist. Most recipes call for brown sugar or sugar. I substituted for coconut sugar (gula kelapa/gula merah/gula jawa) which has a lighter colour compare to palm sugar (gula aren/gula palem) and common to be used in Indonesian cooking. As I don’t consume any alcohol beverage, I omit the rum and/or wine addition. So feel free to add with wine, vodka or make it Jamaican with rum! This recipe goes to Masbar event “Celebrate”. 2. Once water is boiling, add sorrel, orange peel and cloves. 3. Boil for 30 minutes. 4. Cover tightly and steep overnight. 5. Strain and add coconut sugar syrup to taste. At this time, you always add any spirits that you like. To have strong gingery flavour, you can grate the ginger. But, if you don’t like it too strong, just slice them up. Store well in the refrigerator. You can also use half the water and then fill up the glass when serving with club soda or Perrier for a fizzy drink. Kalo di Indo, namanya rosella kah? Or beda ma rosella ?__? Hey, wishing you Happy Holiday! Beautiful photography as always :)! Pepy, thank you! I learned a new plant today. A totally different kind of sorrel, the roselle plant. That looks so vibrant and fresh! thanks for sharing! I've never had or heard of this before but it sounds delicious! Happy holidays! This is a beautiful drink and I love the color too. Beautiful in red and I would love to have a taste! Oh, I love Hibiscus tea! Thank you for sharing! This is something new to me, so pretty and festive looking! Happy new year Pepy! Mmmm…this drink looks so healthy and refreshing! Love it. Happy Holidays! Love the colour of this! Haha I admit I totally thought you meant mushrooms when you mentioned a sorrel drink earlier. I love the rich color of this drink and bet the test is splendid as well. Happy New Year, Pepy! This drink sounds and looks delicious! 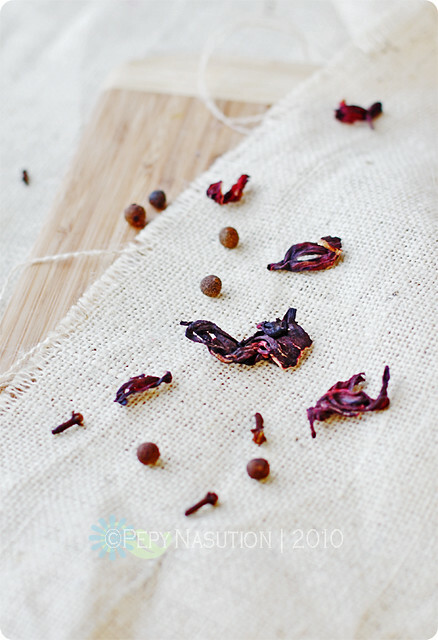 I love hibiscus/karkadé/sorrel and have never tried with ginger and spices! Will surely try soon! With Christmas just around the corner, sorrel will be coming in to season soon. It is a must-have in every home in the Caribbean during Christmas. Have you ever had it made with the fresh sorrel? Sublime.